If you have learned a language such as Spanish and French, you know it is difficult. But what if you are learning a character-based language such as Japanese or Chinese? That difficult task just got harder. It takes years to be able to use one foreign language. Can you imagine how hard it would be to learn more than one language at the same time? Believe it or not, some of international students from Indonesia at Hesston College are learning multiple languages. Vicky Gunawan, a sophomore, is tackling Japanese. 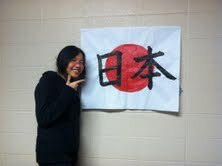 Vicky Gunawan, a sophomore, is learning Japanese. Gunawan says she really enjoys learning Japanese and can have simple conversations in Japanese. She is also interested in learning French in order to pursue her dream: traveling all around the world. She says she will not stop learning languages. Nadia Asprila, a freshman, is learning English and Chinese at the same time. She took a Chinese class for six years in Indonesia because the class was a requirement. Crisentia Celine Gregor, a freshman, also has a lot of language experiences. She learned Japanese, Chinese and also German in Indonesia because she was required to take those language classes in school. Like Gunawan, she’s focusing on leaning Japanese. She studied Japanese for three years and she can even read some Japanese. She frequently studies with her Japanese friends.